Cane toads heading back to Queensland. Is toad busting a waste of time. To fence or not to fence. Nicholson station cane toad research base established. Toad busting by boat on Auverne station. Banksia community of the year winner. Toad busting history and contacts to date. Toad cannibalism and KTB results. Vietnam vets help toad busters. Toads can invade all Australian mainland capital cities. P.M. and treasurer sign up for toad busters . Wet season toad reconnaissance by helicopter. Ag W.A. gives permits to KTB for research. Federal government: $69,011. This was for a second hand bus and trailer to take our young toadbusters to the front, who do not otherwise have transport to the colonising front. WA State government: $36,000. We are grateful for this grant, which recognises the remarkable field work of the KTBs and will go towards field costs and capital equipment. BPWA: $20,000. Biodiversity Protection WA – a commercial fundraiser. This donation was for recurrent field costs – which is where the highest expenditure is generated, actually paying for food and fuel for our toadbusters in the field – and for damage to their vehicles and equipment. Generous private donations are still flowing but we are now looking for corporate sponsorship and significant government support. 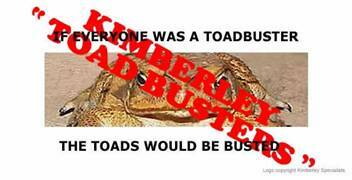 KTB toadbusting is becoming more and more expensive as more and more people are in the field, as toadbusters each weekend. From our small beginnings in the field in September 2005, our costs have risen to up to sometimes over $5,000 each weekend, especially when we need some helicopter reconnaissance and team drops in the wet season. Over 30% of the Kununurra community is signed up for toadbusting and it is only lack of transport and support dollars that keeps some of our toadbusters at home on weekends. Contacts: Lee Scott-Virtue 0429 406 935 or 08 9168 2576; Sandy Boulter at Friends of the Kimberley Toad Busters on 0427 508 582.